Many Assyrians believe there's a historical connection between themselves and Native Americans. They see many similarities -- tremendous bravery, a sense of homeland protection, eagle symbols, nature inspired themes and designs, group dances, and music. Others think the idea is crazy. Assyrians and Native Americans are two different peoples from two different continents. But how do we explain Chief Joseph's cuneiform tablet? "The chief said that the tablet had been passed down in his family for many generations, and that they had inherited it from their white ancestors," said Mary Gindling of History Mysteries. "Chief Joseph said that white men had come among his ancestors long ago, and had taught his people many things. His story echoes those told by Native Americans in both North and South America about white culture bringers. But in this case, Joseph had a souvenir to demonstrate the truth of his story." The ancient tablet is madeof baked clay and is one square inch in size. The cuneiform writing translates into a receipt for a lamb and dates it to about 2042 B.C. The tablet was presumed to have been made in southern Iraq. Dr. Joseph Mahan thinks the Hearn tablet was made here using the lost-wax method because other molten lead pieces with the same patina were also found on her property. Gloria Farley from Oklahoma is a researcher interested in pre-Columbian visitors to North America. In 1980, a small heavy black stone found near Hodgen was brought to her for her opinion. The design resembled a flower with a complicated base. 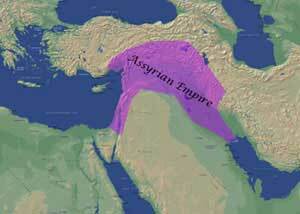 If Assyrians did come to these lands so long ago, how did they it? All we know is that evidence suggests Native Americans and Assyriansdid have ancient connections, and those who believe this theory might not be so crazy after all.